This will be our Last Drill at NOSC Buffalo and we will be moving our supplies to the ships on Sunday. 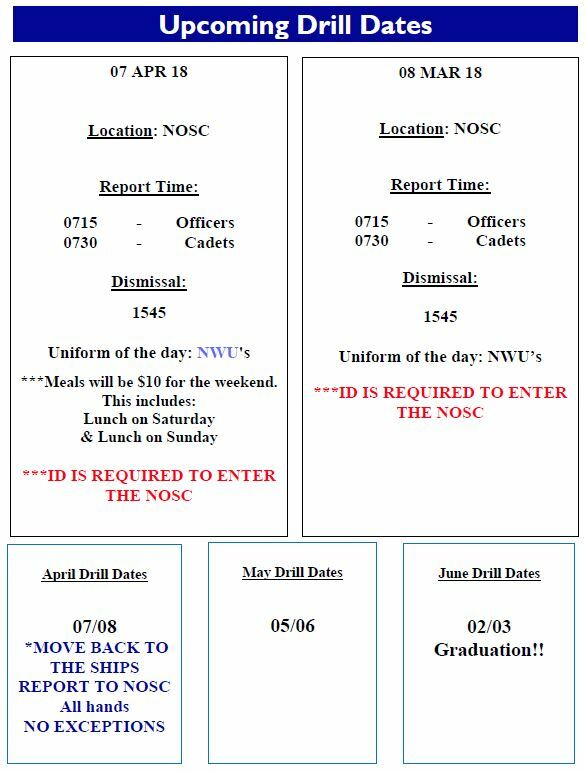 Drop off and pick-up will be at the NOSC so there is no confusion as to where to pick up your cadet. Our Color Guard Season is Ramping up; see below for the list of events coming up quickly. accomplishments. You will be missed Sir! Stand easy as we have the Watch. Hope everyone is ready for the PRT, remember you must pass to attend a training! Also as a reminder it is mandatory that all cadets attend one training a year, failing the PRT or not attending a training can get you terminated from the program.